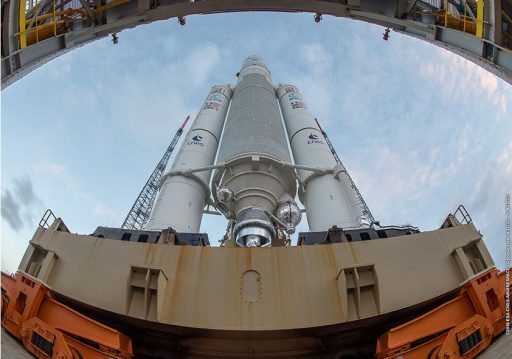 Europe's Ariane 5 rocket is set to rumble off from South America on Thursday to carry into orbit a pair of communications satellites for the Japanese Ministry of Defence and commercial operators JSAT and Avanti Communications. Treated as a semi-secret satellite, Superbird 8 / DSN-1 is riding into orbit in the upper slot under Ariane's payload fairing, carrying an X-Band payload for use by the Japanese defence forces while a commercial Ku-Band payload operated by SKY Perfect JSAT will provide various networking solutions. In the lower slot is HYLAS 4, a four-metric-ton satellite built by Orbital ATK for operation by Avanti-Communications as part of their high-throughput fleet. Ariane 5 targets liftoff at 21:34 UTC and will be in action for 34 minutes to lift the two satellites into an elliptical orbit peaking 36,000 Kilometers in altitude to check off its second of up to seven missions of the year.